Who knew a quick trip to Indiana would result in such angst? I drove to Ft. Wayne Indiana to take a class from the famous Jacquie Gering. We met at quilt market last year and just clicked. When I arrived in FW, I gave her a call and she left the quilt show and came back to her hotel room. We stayed up quite late and laughed and talked and caught up on life. I got a personal showing of every single quilt she had brought with her. This alone was worth the trip! All of them were so cool, but the best part was the stories behind each of them. I do regret that I didn't take many pictures of her quilts though, just in our class. Friday morning she was teaching a class called "Not your grandmother's log cabin". I was so excited to take a class from her! Here we are going into the show. We were able to get her entire class stuff and all my stuff into the cart and one suitcase! We arrived at class and set up our work stations. Jenny (who I now know has a blog) and another friend, Erica. Jacquie talked a lot about "process" and showed some of her quilts. It started me thinking in a way I had not before. It was kind of a revelation, actually. She walked around the room and spoke with everyone, helped everyone, rejoiced with us as we made discoveries and it was so joyful. What a truly eye opening experience for me. I began to see things in a way I had not before. I was actually creating in a new way. no two quilts looked at all like any of the rest of the quilts! Everyone's blocks were such an expression of who they are. but the style is totally different from the usual things I have done. I do have plans for a finished top from this too. My DH has been bugging and bugging me for a log cabin for YEARS. He will finally get one, this one! Completely designed by me, totally my personality with all my heart poured into creating for him. When class ended Jacquie, Jenny Erica and I walked around the quilt show. Jenny had 3 quilts in the show. Jacquie and I left and headed out for some dinner. We found our way to a place and had a fantastic dinner. Miss J had Walleye and I had Salmon. The food was really, really good!! We went back to her hotel room and just collapsed. and managed to snap this picture of all her quilts rolled up at the foot of her bed. The next morning was the trunk show and brunch. I was helping hold up quilts so didn't get a chance to take but one photo and it was a horrible picture ( the background of the quilt looks yellow and it really is aqua!!) so no pictures of those for you. This is some of the quilts waiting for the talk. Jacquie did a fabulous job and everyone was entertained and amazed. and got a little teary eyed. Nice to see that after 29 years you still love your husband!!! Mine will be 29 years this year too. I can't believe how much we actually have in common. After her class we went to a quilt shop with Kris, Jenny and Erica. I did buy some things and will post about that later. Kris drove us back to the quilt show and Jacquie and I got in her car and she drove me to my car. It was kind of sad to see this time come to an end. I felt like I was leaving my sister. I hope we get to spend some more time together really soon. I have to say that I had a lot of time to think about the time spent with Jacquie on the trip home. I came to the realization that maybe I need to work a little harder at finding my own voice. I feel like I am straddling a line with feet in 2 camps. I have been having fun but maybe it is time to decide what I want to do with my quilting life. I don't think Jacquie knows how much my time spent with her shook up the way I am looking at my future, but for this I will be forever grateful to her. I am looking forward to breaking free and going BOLD!! I know that Amanda Jean is talking about her pattern testers today. I wrote a post yesterday about my quilt that I made when pattern testing for her new book. Now I want to show you what I received from AJ as a thank you for doing the testing. I received a nice box containing fore things for both Pauline and me. a handwritten note and a mini quilt! Funny that it is the one Pau1ine tested! I seriously love that I have such nice friends! It was an honor to do the testing for you AJ and this went above and beyond a necessary thank you! New Book and I'm In Mentioned In It!! are going to be telling you all about us. The behind the scenes pattern testers. and a blessing to work with Amanda Jean! I hope to be able to do so again in the future. I have to say this is one amazing book!! It is well written with easy to follow directions. The quilts in the book are wonderful, I want to make them all. On top of all that it is also reasonably priced. This is a book all quilters should own! Long story short I was able to test a pattern in the book for her. It's the one called High Five. I have been dying to share this but could not until the book came out. So on page 120 there is little blurb about "Make it yours". The 3rd and 4th ones are talking about my quilt!! I was so excited that she put this in the book!! I appreciate AJ allowing me to test one of her fabulous quilts. Here is the little part in her book that thanks all the pattern testers. Seriously, what a wonderful book! I hope it becomes a smashing success!! Couldn't happen to nicer people! That's what I have been doing lately, trying to get all the things off my "gotta" list. I can cross off 2 more things now! I was cleaning out a bag to use on the shop hop when I found 2 Birdie Stitches blocks all embroidered and waiting to have the squares sewn around them, so I did that. Not too bad just 3 more to stitch and I can put the quilt together! I put this quilt together this weekend also. I did a U of M one and then this one. Both are donation quilts for Margaret's Hope Chest's quilt for kids drive. I sent it off to Liz for quilting yesterday. I got my Sliced Apples quilt back from her last night with hairy caterpillars all over it! I need to trim it up and bind it. I also got the U of M quilt back to trim and bind too. I will try to take some photos tonight. I still need to cut out the zig zag quilt for MHC but I don't think that is going to happen too soon. but will bring the white to cut tonight too. Two good things to get done tonight! I am meeting Stacey tonight for dinner too. I am looking forward to catching up with her. I am going to the Appleseed Quilt show in Fort Wayne Indiana and I leave tomorrow. I will be meeting up with Jacquie (she's teaching a class on Friday and has a trunk show on Sat). I am taking her class and we will be discussing upcoming projects too. I am really looking forward to spending some time with her too. OK I gotta dash, more later! I have been MIA lately and I'm sorry about that. Life continues to be very busy over at my house! with some of the Wednesday night quilters, Shirley and Barb. I tried to restrain myself and did ok, still need to work on it but not too bad overall. We went to 7 shops! I'm going to share what I bought at each shop. Photos of some of the shops are on my Flickr if you want to see them. We started at the Lake Street Mercantile and that's where we took the bus from. They did a really nice job and kept us on time and home early! Also the BEST chocolate doughnuts I have ever had! The first actual stop was The Quilting Season in Saline. A small shop but nice. They had homemade cinnamon rolls waiting for us there! They also had this amazing rug! This is what I bought there. A half yard of MSU Spartan fabric that I don't own. The next stop was Bits and Pieces in Wayne. This is where I bring my Bernina for her yearly spa visit. Jay, while I was there. 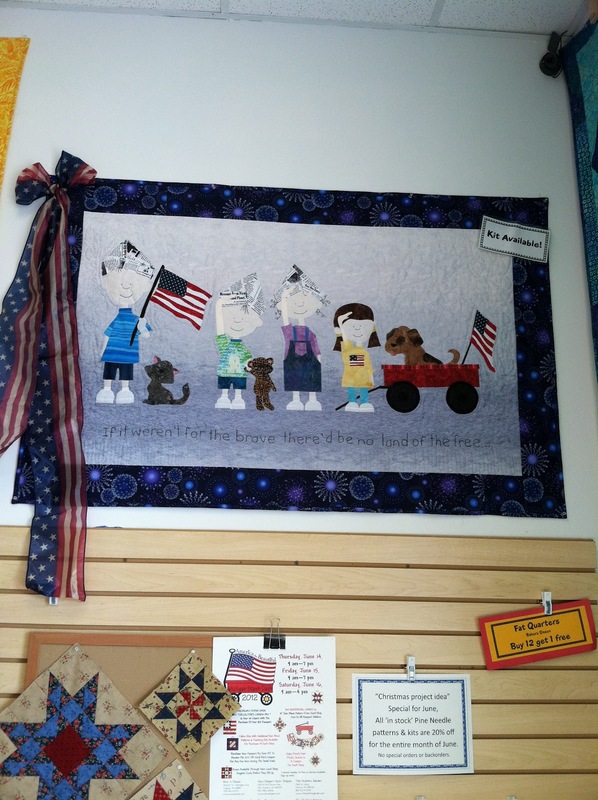 Next stop was Quilt-n Friends in Sterling Heights. They had a very nice shop, but I didn't buy anything there. I can't remember which shop came next but I think it was Sew Elegant in Fort Gratiot. This shop has a LOT to choose from, but I restrained myself! Just look at that butterfly from Hushabye!! They still had quite a bit of Hushabye left too (see photos in my Flickr). We stopped at Sew Together in Richmond too and I bought a Frixion red pen and this magazine. 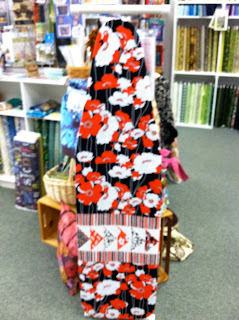 There is a great pattern for those mermaids from Kellie Wulfson in there! so we did some of this while on the way to it. Mother and daughter, so adorable! The last stop was my favorite (and I knew it would be). The Quilter's Garden in Fenton. If you haven't been here you should go. I found LOTS to love here. Some peacock fabric for pillowcases for DD1 for Christmas. This great wreath pattern that I have been looking for for a long time. I need to try these, especially the Halloween one! And look at that adorable apron! It is just screaming for some vintage modern! 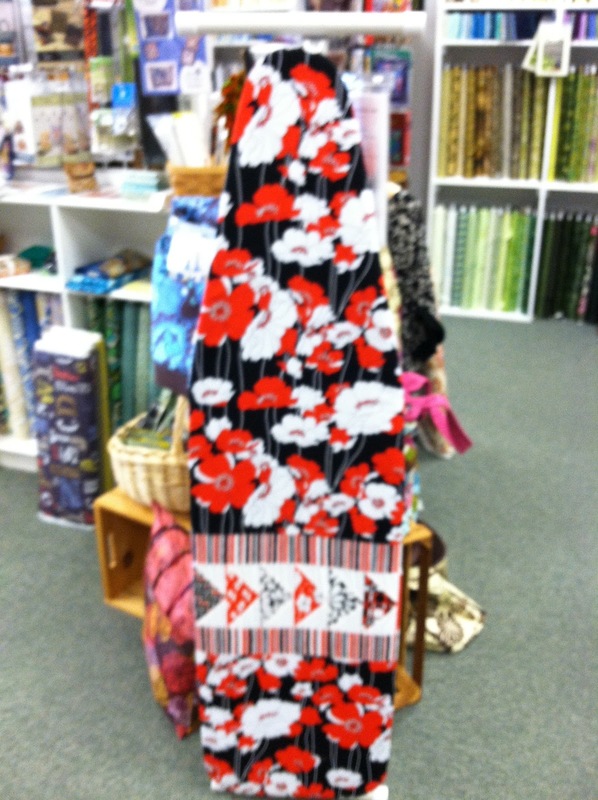 I refrained (just barely) from the pattern for this ironing board cover but will probably buy one later. I didn't buy these patterns but I was tempted. An owl, frog, pig, cat, dog, raccoon and more. 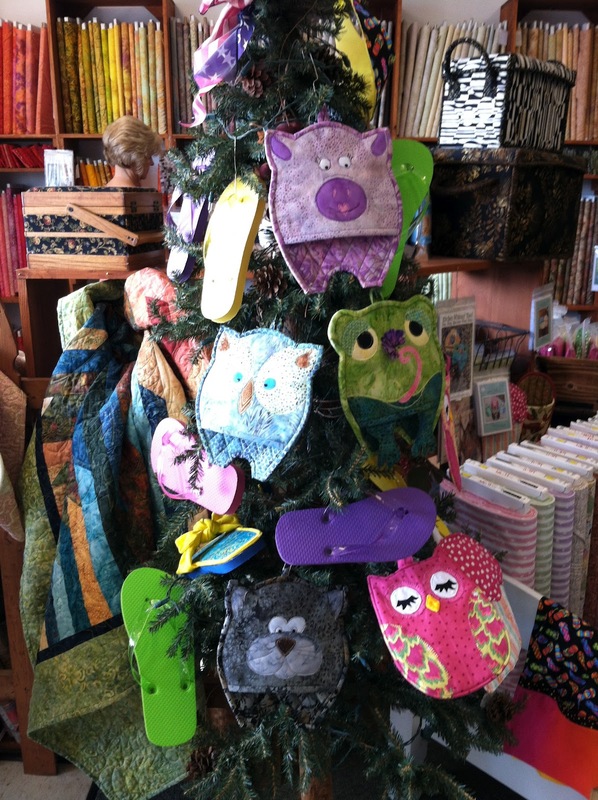 Can you see that flip flop in the bottom left of the tree (blue and yellow) so cute! used twisted the yellow for the part you slide your foot into. I didn't happen to see a pattern for that but we were not the first bus there. I may have to track that down, they were really cute! Then they had this wallhanging. Reminded me of the Peanuts gang. They were out of the pattern and the kit too. I did buy the newsprint for the hats though. All in all a very successful and fun day! Shop hops are such fun aren't they? I thought I would share with you a few cute things I found while out and about recently. First off were these adorable note cards. Just one dollar at Michaels! Seems like I am always looking for note cards to send out with swap stuff, aren't you? Then I went to JAF to get the blue and yellow and the dark green for the tumbler quilts when I happened to go past the novelty fabric and this bolt just jumped into my cart. Well 3 yards of it anyway. Since DD1 raises peacocks I am always on the look out for cute peacock fabrics. She loves purple too so this one was perfect. if anyone knows anyone that has them for a decent price. As an added extra bonus DD1 told me she loves this print! we will probably be drawing names for prizes soon for the sliced apples QAL. be sure to post your photos in the Flickr group. (you need to have at least cut the quilt out). I have been sewing so much lately the cats are feeling neglected. Here is Jack, sleeping on my sewing chair just so he can be near me when I am cutting! Almost camouflaged on that chair isn't he? Getting ready to leave work and go home. Quilting tonight with the "ladies", then over to Cori's to lay out a quilt top. PS: If you haven't checked out Cori's online fabric shop in awhile take a look! She has Flea Market Fancy, and Lush (running stitch) listed with more coming in every day!! These are 2 of my favorites!!! PPS: No one answered me about another QAL.